Almost 4 years after Curiosity landed on Mars, it is still up and running – and while it has not discovered current life forms, the basic question whether Mars could have once supported an environment for primitive life forms is a clear “yes”, according to NASA scientists. The rover identified carbon, hydrogen, oxygen, sulfur, nitrogen, and phosphorus – all key ingredients for life. This knowledge is based on data from the onboard ChemLab, where powder drilled out of a sedimentary rock is analyzed. 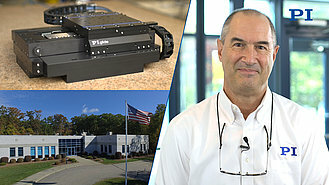 Onboard the rover, there are several PI motion and positioning systems designed to provide highly reliable service for many years, even under the harshest of conditions. 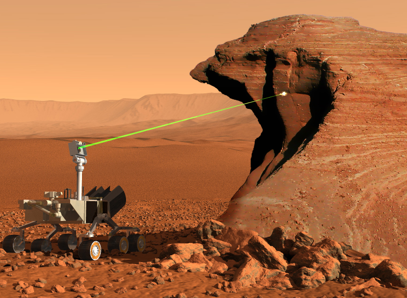 The initial excitement and pride over the Mars Curiosity rover’s inventive descent to the Martian surface has given way to continuous, methodical scientific exploration using a variety of sensors and instrumentation. The images taken by the onboard cameras usually get most of the press, with their stunning panoramic views and occasional amusing curious sightings. But science is a patient discipline, and experiments which peel back the layers of Mars’ composition and history are underway each day now. 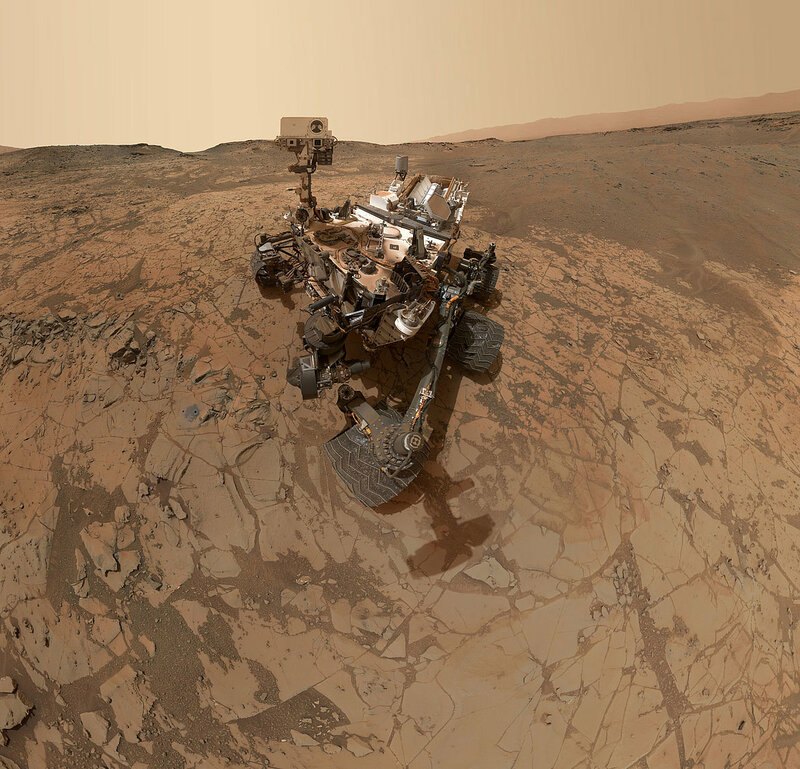 Performance and reliability are essential for all research and industrial applications, but the prospect of a service call more than hundreds of millions of kilometers away poses special challenges, so it was critical for every component of the Curiosity rover to have proven reliability and robust performance. 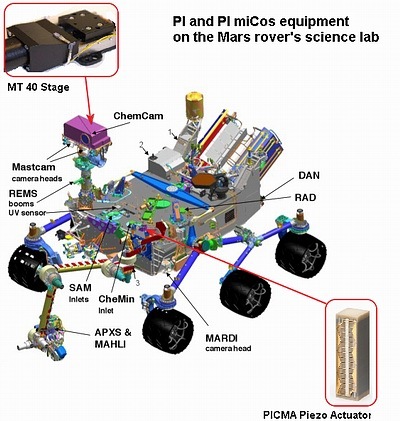 We are thrilled that PI and PI miCos products are part of the rover’s instrumentation package and performing important science on Mars. Follow the Mars Curiosity Rover on Twitter. 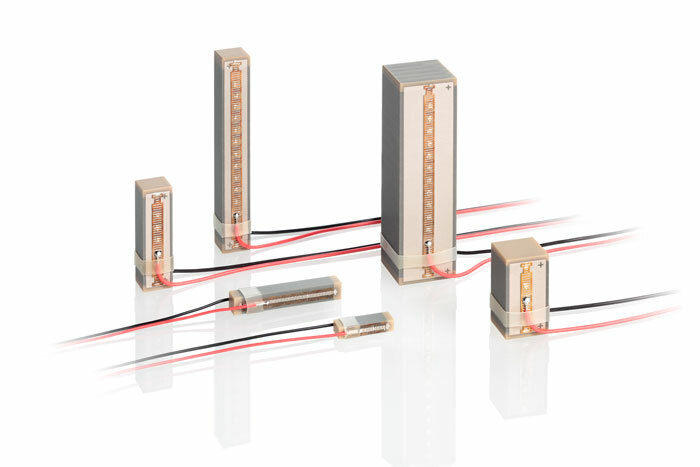 PI’s high-reliability PICMA® multilayer electro-ceramic actuators have been the gold standard for reliability in nanopositioning and are the heart of PI’s nanopositioning stage products. 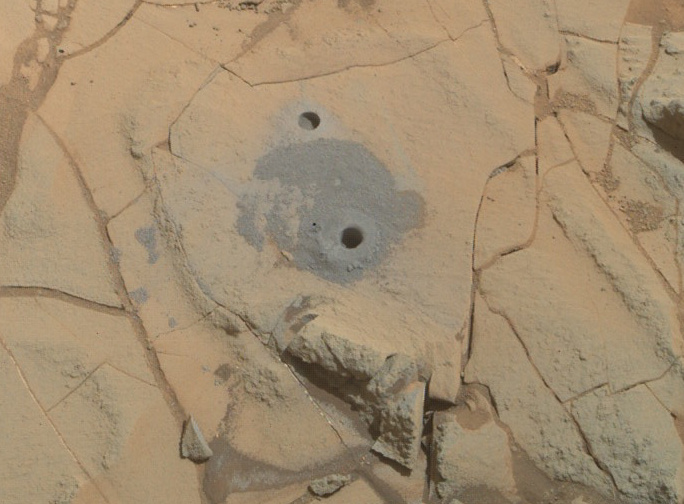 NASA’s testing of these actuators validated their performance over 100 billion cycles, which aided their qualification for use as the foundation for the Chemistry & Mineralogy (CheMin) instrument. 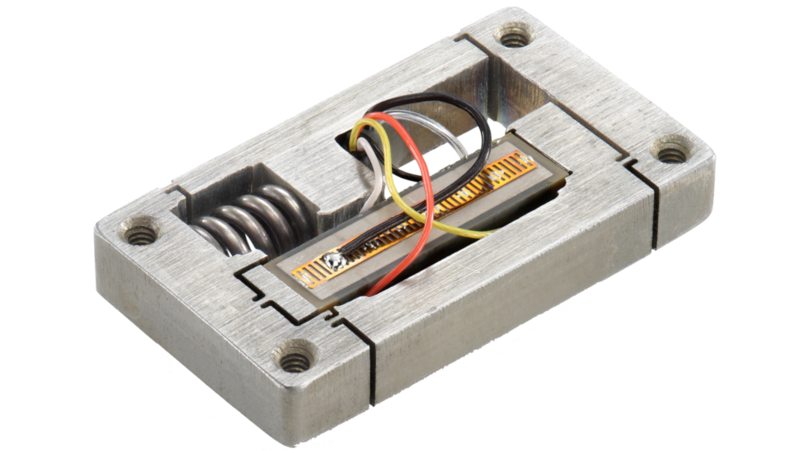 Sixteen PICMA piezo actuators are embedded in a flexure arrangement mechanism for the sample handling system. Thirty-two sample chambers (including five containing fixed references) are arrayed around a sample wheel; the chambers are arranged in pairs with a piezo stack actuator coupling each pair. This system feeds mineral powder samples through a funnel into the individual sample cells. The powder in the tunable sample cells must be shaken at variable amplitudes and frequencies in the range of 0.9 to 2.2 kHz to homogenize particle size or density segregations. 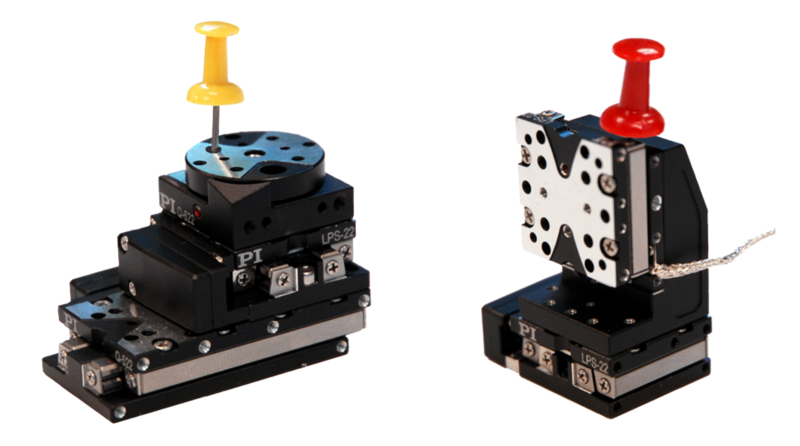 This is where PI’s piezo mechanics expertise comes into play. 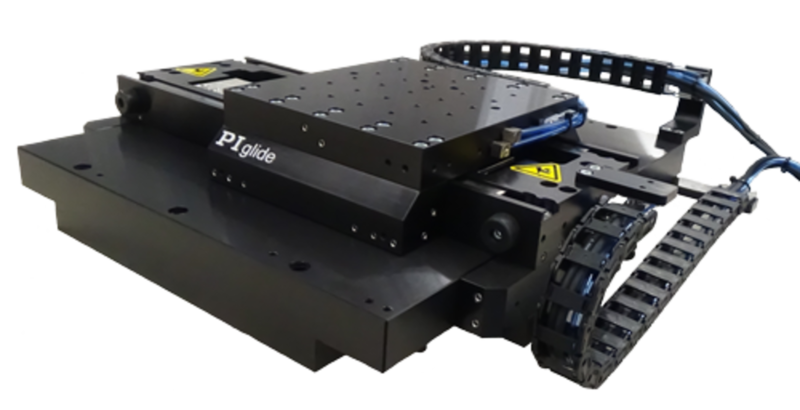 PICMA multilayer piezo actuators were installed to precisely control the vibrations in the feeder. The feeder provides the transmissive X-ray diffraction and fluorescence spectrometry system with new material to analyze. Clearly, their reliability is crucial to the mission’s success. Metrology is performed during the Martian night so that the CCD sensor can be efficiently cooled. This rover never sleeps! 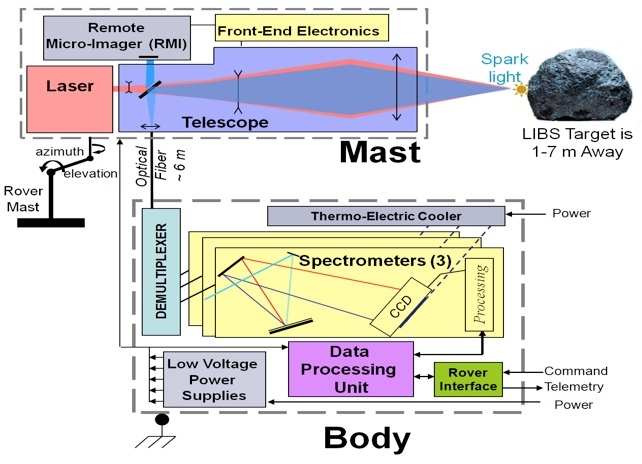 While the PICMA actuators are hard at work performing spectrometry on Martian mineral samples, another experiment called ChemCam is busy performing the first interplanetary Laser Induced Breakdown Spectrometry (LIBS). This all-optical, non-contact technique utilizes a powerful, pulsed infrared laser to induce optical emission from interesting samples. 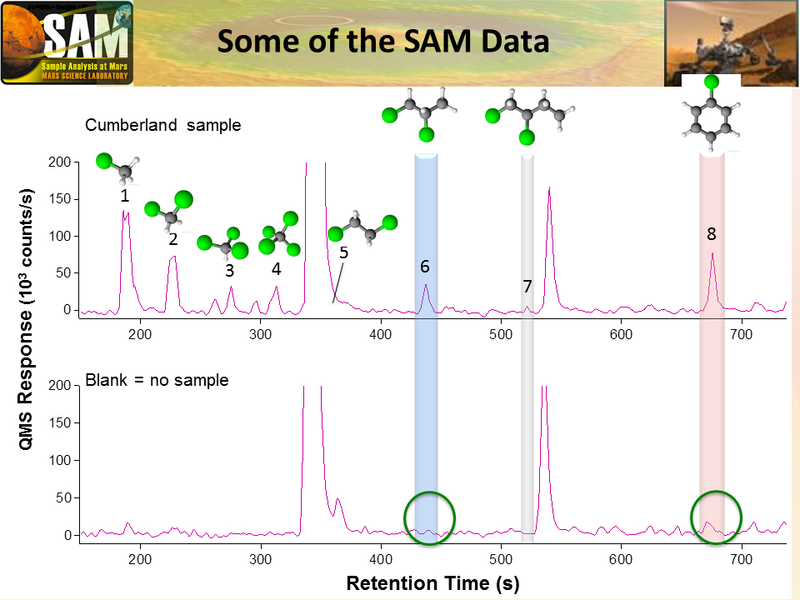 The visible, sparking flash that results from each laser pulse is evaluated by a fiber-coupled spectrometer, with chemometric analysis providing the material breakdown of the sample. 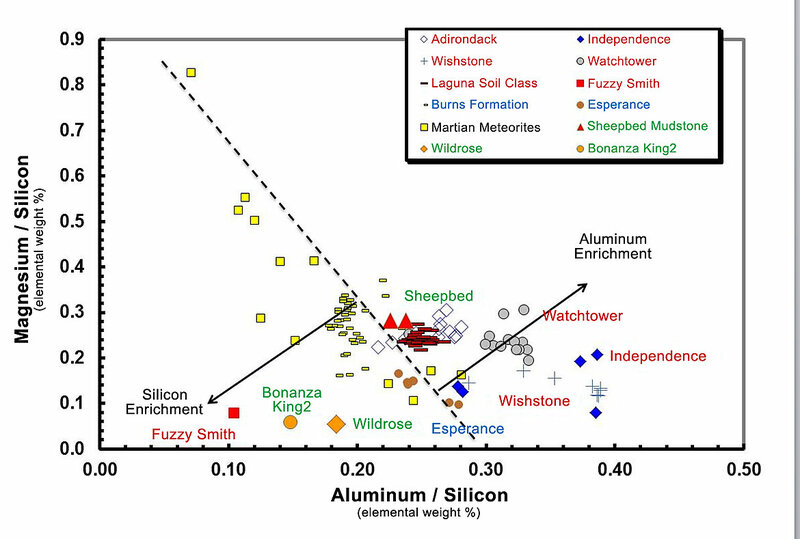 One key advantage of this methodology is that the geologic sample being tested can be a distance from the rover. 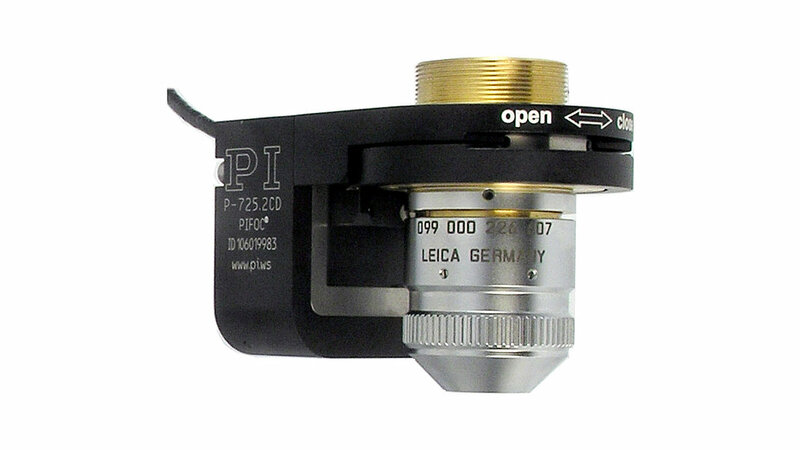 But it requires exacting control of the optical focus, and that’s where a space-qualified variant of the PI miCos MT Series stage comes in. 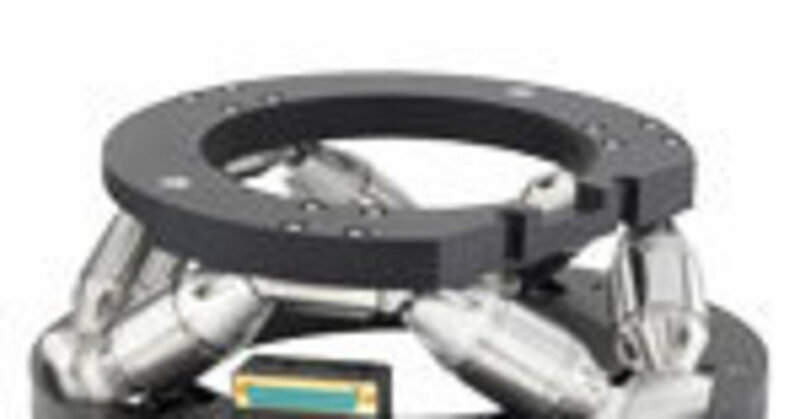 This high-precision stepper-motor stage axially translates the secondary mirror of the telescope which collects the optical return from the sample while providing imaging information to place the sample within geologic context. The shocks and vibrations of launch and landing necessitated that every component in the stage, from the stepper motor to the crossed roller bearings, be validated and optimized to eliminate the possibility of failure or degradation. The autofocus process places stringent demands on the stage’s performance – resolution, backlash, trajectory quality, and stability are all crucial for responsive and predictable operation and reliable data. The wide temperature excursions to which the stage was to be exposed in flight and on the Martian surface added significantly to the challenge. Modeling and thermal compensation technologies and sophisticated vacuum-compatible components, coatings, and lubricants were utilized. 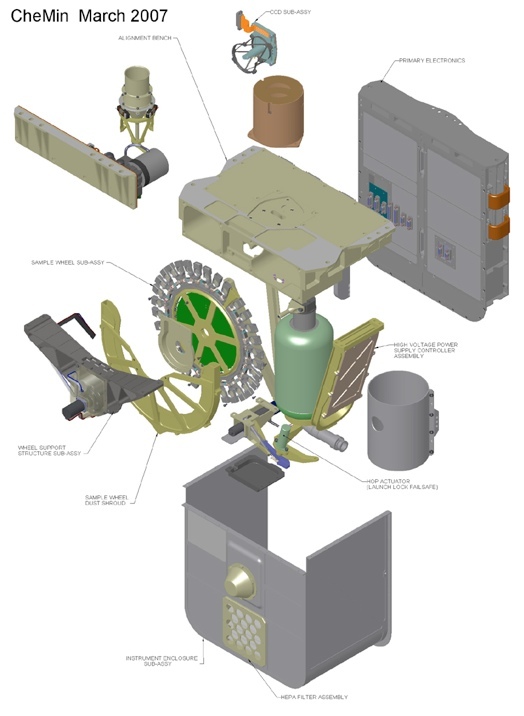 This specialized variant of the commercial-off-the-shelf (COTS) stage passed all preflight tests and validated the cost-containment strategy of leveraging COTS designs.